With space being the new big thing in the PC sphere, it’s no wonder developers are dropping out of their full-time jobs to pursue personal projects set in the inky black. The latest to do so are two former project leads from DICE, who have formed new studio Fugitive Games and created Into the Stars, a new open-universe space sim with some serious ship management elements. The game is almost complete, but to add that extra layer of lovely sheen Fugitive Games has set up a Kickstarter to pull in a little more funding. Into the Stars looks familiar with its Elite-like industrial cockpit view, but its DNA seems to be shared much more closely with FTL. Whilst you can hurtle around space freely, the game places massive emphasis on managing your resources and hiring crew members to make sure your ship is operating at maximum efficiency. 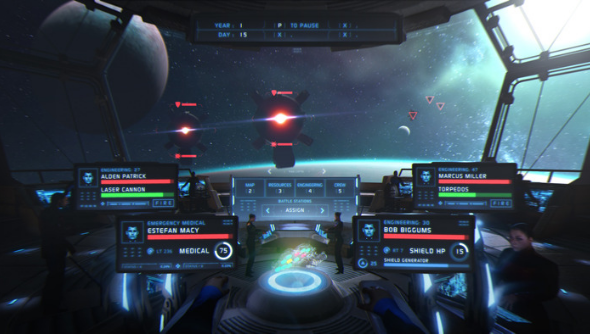 And when it comes to combat, Into the Stars uses a ‘volley-based’ system, which appears to be tweaked variant of a traditional turn-based method. It seems that whilst looking like a space sim, Into the Stars will actually be a strategy game in action armour. The solar system will be made up of ninety zones, inhabited by friendly and aggressive aliens, and chances for diplomacy and scavenging. Care and attention will be required though; crew members are subject to permadeath, so be wary before sending them into the danger zone. The extra money raised by the four-man team will be used to add some lovely polish to the game, such as hiring Mass Effect composer Jack Wall to conduct an original score. Fugitive Games is looking for $85,000. If you fancy dropping a few coins in the kitty, visit the Kickstarter campaign page.